August 15, 1898 was an important day at the Brown residence in Round Valley. That was the day that George, a Native American destined to leave his mark in the Owens Valley, was born. George Brown attended the Carson Indian School at Carson City, Nevada. He was almost twenty years in 1918 when he went to work for Jim Birchim on the Birchim Ranch. After about a year, he left for a better job - breaking and riding wild or spoiled horses. In 1922, he began driving eight to ten horse teams for Bill Rowan. His job was to haul large loads, fourteen to eighteen tons of stone, from the quarry in Round Valley to the railroad station at Laws. This was slow, tedious work involving a two-day trip, much of it over loose, dry, sandy soil. 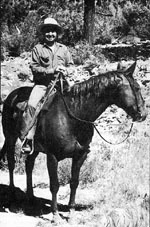 George Brown on his horse, circa 1977. 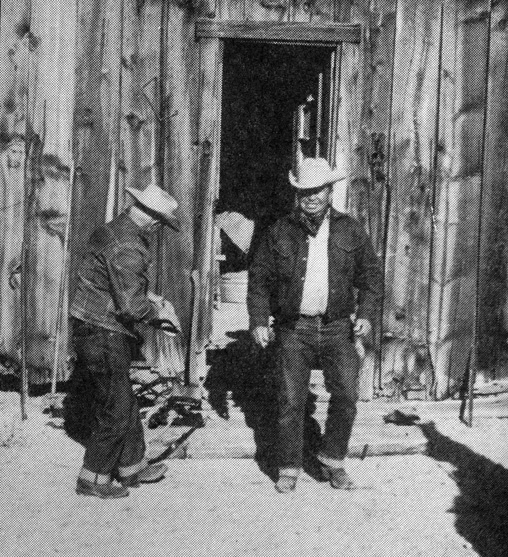 After Christmas 1923 George was hired for a forty day cattle drive by Frank (Sage) Cornett. 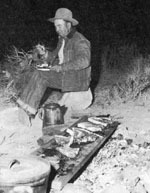 He helped push a thousand head of steers from Round Valley, through the Owens Valley, and over Walker Pass to Bakersfield. By the time he was twenty-six, he had become an experienced cowboy and mule-skinner. He went to work for Herb Francisco. The two men shipped two carloads of mules from Laws to Los Angeles for the Elington and Francisco Construction Company, to be used for leveling and grading the first subdivision in the Wilshire District. George's job was to see that the mules did their job. While he was working in Los Angeles, the Indians in the area would gather at 16th and Main Streets once a month for a popular dance with music by a piano, sax, clarinet, and drum band. George attended these dances and at one of them he met his future wife, Frances Chrest. Chow time after a long day's work on a cattle drive. Frances had been born in Quincy, California on February 1, 1907, and attended school at the Sherman Institute in Riverside. Frances says, "We got together at those dances. He was a cowboy and I liked that!" They were married in 1925 and George brought his bride back to Bishop on the Slim Princess. Over the years, five children were born to them: Kenneth L., Betty (Alexis), George D., Patricia (Elbers), and Polly (Cox). In 1926, George started a dairy at Silver Lake. 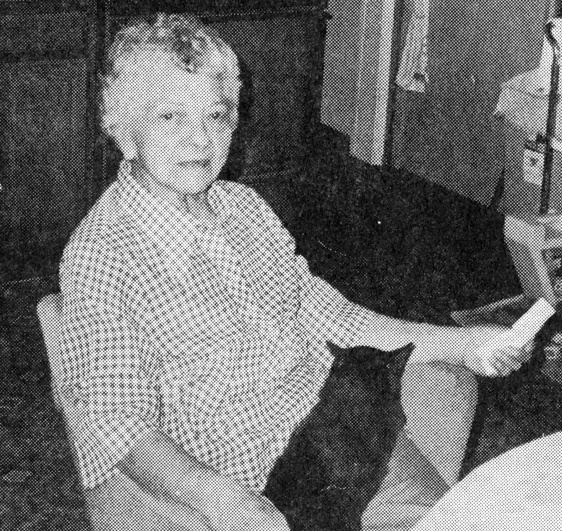 Frances's job was to milk the cows every morning and evening. She says, "It was a job that I didn't enjoy." After they bottled the milk, they placed the bottles in a large trough of ice-cold water to cool. When it was cool, they skimmed off the cream and capped the bottles. George, in his Model T Ford, delivered it to the June Lake, Silver Lake, and Gull Lake areas and to Cunningham's Store near Mono Lake. The price was twenty-five cents a quart, delivered. George also leased 160 acres in Round Valley from the Department of Water and Power. Every fall he drove the cattle down through Long Valley and over Sherwin Hill to Round Valley where they wintered over. Then in the spring, he drove them back to Silver Lake. When the Inyo Bank failed in 1927, George lost all of his savings. He sold the dairy to Slim Tatum and returned to ranching, raising cattle and growing contract hay on his Round Valley lease. When the lease expired, he sold his cattle to Cy Williams and moved into the Tom Jones house. It was leased by Frank Arcularius; and George contracted hay for all four Arcularius ranches and tended their cattle. George was more at home on horseback than anywhere else, but one day he found himself not so "at home." He was tending herd for Frank Arcularius, riding through deep grass, when his horse spotted a snake. The startled horse started to buck and deposited George on the ground. 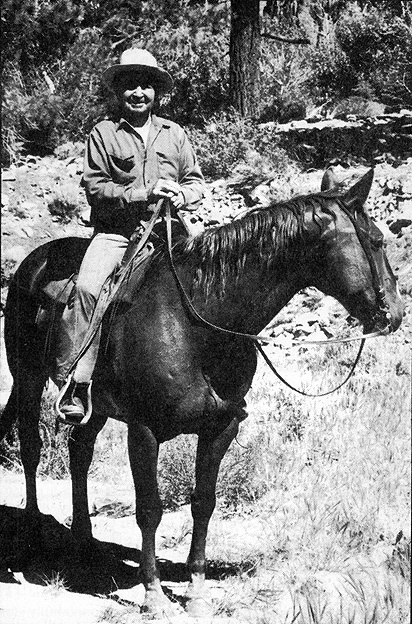 The horse took off for unknown parts and George had a long walk back to the ranch house. In the spring of 1934, the Jones house burned and again the Browns lost everything. Frank Arcularius was there to help, providing them with a house on the Pauly place. Eventually they leased the Roberts house on top of the little hill in Round Valley, where they remained for the next twelve years. The view was excellent and their children had fun racing up and down the steep road, but Frances mostly remembers their efforts to pump water with a gasoline-powered pump to the house. Packing mine timbers for the Tungstar Mine. [Curtis Phillips photo] During this time, George started the Pine Creek Pack Outfit. 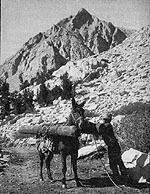 He guided people and transported their equipment and supplies into the Pine Creek area and over Pine Pass into the French Canyon backcountry. He also packed many difficult loads of mining supplies and equipment to the Tungstar Mine in Pine Creek Canyon on the north side of Mt. Tom. 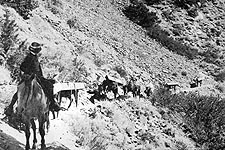 All sorts of gear, lumber, and mine timbers, even a large cable, went to the mine on the backs of George's mules. The cable was a particular challenge. The Tungstar people didn't want to cut it, and asked George to bring it in in one piece. After considerable time and figuring, he found a way to fasten the whole cable on the mules. California Interstate Telephone Company (now Contel) and California Electric Power Company (now Southern California Edison) relied on George to transport power poles and other equipment also in Pine Creek Canyon. He packed and delivered mail, even in the middle of winter when a horse or snowshoes had to be used. 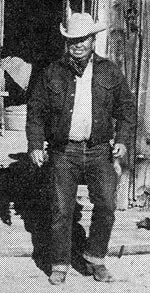 Then in 1943, he sold the pack station to Spray and Ernest Kinney and went to work for Jess Chance, herding cattle. This employment lasted until George received an urgent call to return to the backcountry. Generals George C. Marshall and Hap Arnold of World War II fame were on a vacation pack trip in the High Sierra. They had made arrangements to have mail airdropped to them on regular intervals at designated spots. Unable to locate one of the drops, they sent out an emergency call for assistance. 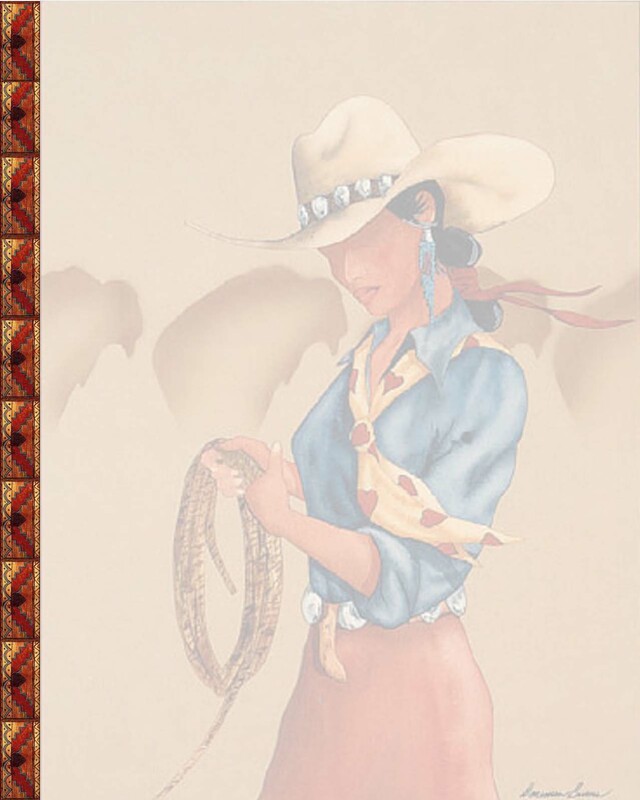 George responded, leaving an unhappy Jess Chance, and returned to Pine Creek Canyon. He climbed up into the rocks, found the lost mail pouch, and continued on as guide for the generals' party, so impressing them that they wanted to take him to Washington D.C. when they returned. U.S. Forest Service authorities talked him out of going, for some unknown reason. 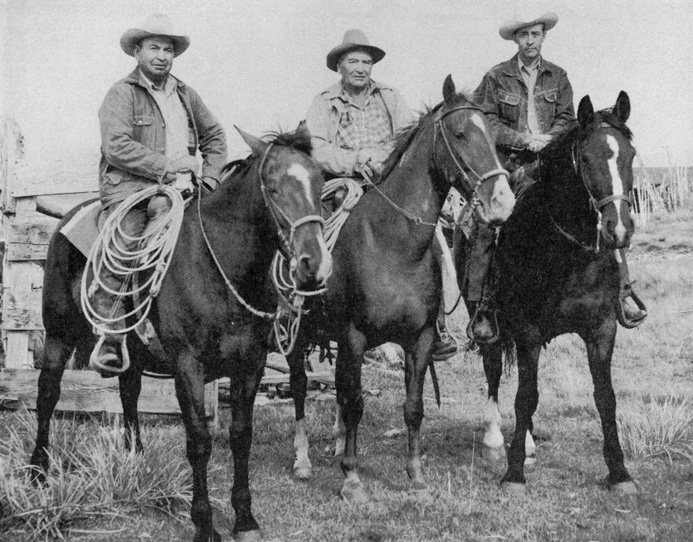 L to R: George Brown, Alex Reeves, Lester Stewart George went to work for the Deep Springs School as ranch manager in 1945, staying there for two years and then moving on to Fish Lake Valley to help Frank Alexis at the Oasis Ranch. After that, he worked for Alex Reeves, continuing for a year after Reeves' death in 1959. Alex once told George he was the only bald headed Indian he'd ever known. George replied: "It's from eating too much white man's grub." In 1960, George went to work for the Little Walker Cattleman's Association and spent about half the year helping at their cow camp. The rest of the year was occupied driving cattle with Norman Brown in Smith Valley, at home in Bishop preparing his horses for parades, or talking in Indian language with Richie Conway. One of the highlights of George's life was his selection as Grand Marshal for the 1969 Bishop Homecoming and Labor Day Celebration. 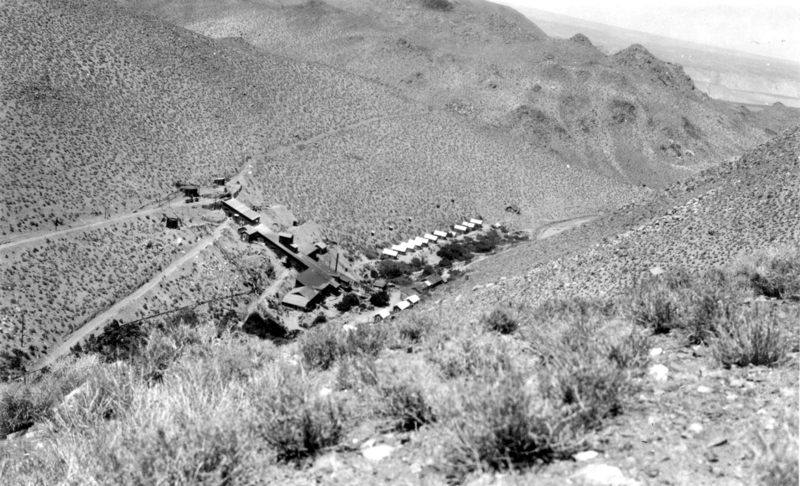 It was an example of the esteem and high regard for George in the Owens Valley. He was at his best, riding at the head of the parade wearing his Indian costume and presiding over the various events at the Tri-County Fairgrounds and elsewhere. Whenever he could, George liked to go fishing, but he was particular about what kind of fish he caught. He and his family were not very fond of the brown and rainbow trout that swam in the lower canyon and valley streams. 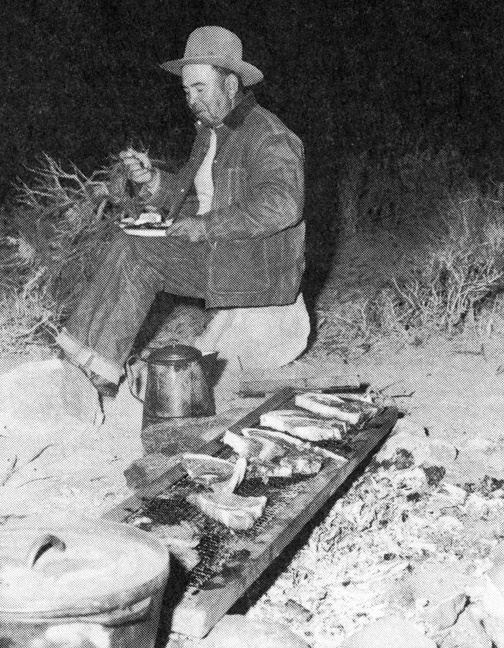 They preferred golden trout, so every time George went into the high country, he brought back a basket full of goldens. Some goldens had mixed with the brookies in Pine Lake and sometimes he fished there also. When Caltrans was preparing to straighten and widen the highway over the sand hill and by the millpond north of Bishop, there was a possibility of an old Indian burial ground in the vicinity of the new road. A team of archaeologists was called to investigate and they hired George, as guide and adviser, helped supervise the dig and, happily, nothing was found. In August, 1984, at the age of eighty-six, George and his nephew Steve were en route to Fallon for the funeral of one of George's brother's daughters. It was storming as they went over Montgomery Pass and the rain had washed out a portion of the road. There was a detour near an old mine. 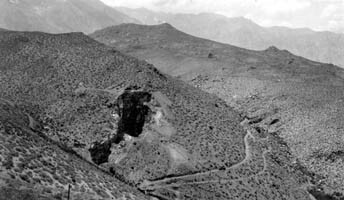 The truck skidded when it hit some of the tailings from the mine that had washed across the road, and George was killed. It was the end of a rich, full life for one of the most popular, well-regarded Native Americans of the Bishop area. His wife, Frances, at the age of eighty-four continues to live on the Bishop reservation. She can't miss the daily "soaps" and enjoys being with her offspring. She is cheerful and alert in a house full of pleasant memories, pictures and mementos of George, their children and grandchildren. Her husband of fifty-nine years may be gone from this earth, but he can rest in peace, content with a happy, productive life. Packing mining cable for the Tungstar Mine. George packed many difficult loads of mining supplies and equipment to the Tungstar Mine in Pine Creek Canyon on the north side of Mt. Tom. 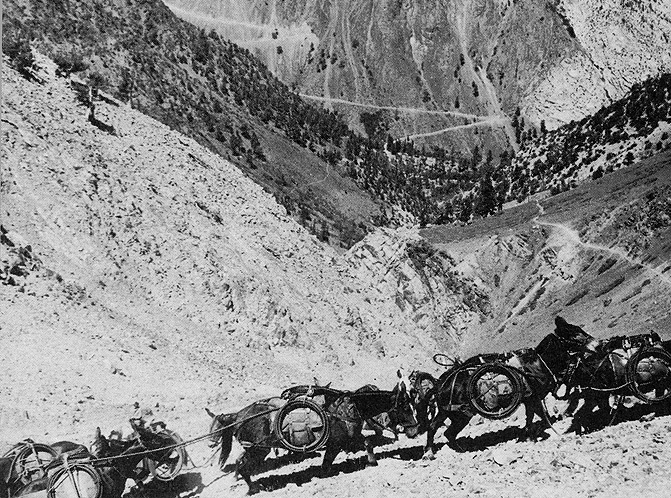 All sorts of gear, lumber, and mine timbers, even a large cable, went to the mine on the backs of George's mules. The cable was a particular challenge. The Tungstar people didn't want to cut it, and asked George to bring it in in one piece. After considerable time and figuring, he found a way to fasten the whole cable on the mules. George packing lumber for the Tungstar Mine. 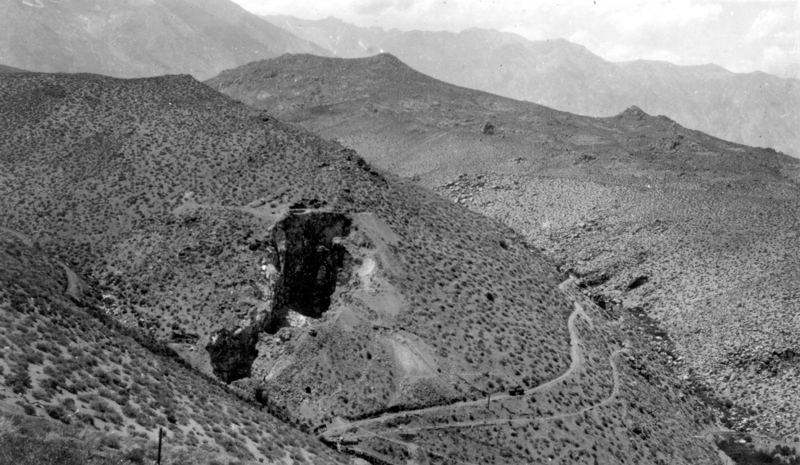 Tungstar Mine "Glory Hole" circa 1918. By Rena Beth Moore with George Brown as packer and cook. Thanks to Doreman Burns for allowing me to use his painting images in the construction of the background of this page. These images are copyrighted by Doreman Burns.